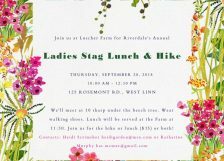 Ladies' Stag is a longstanding Riverdale tradition, for all women in the greater Riverdale community: community members, current school parents, former school parents–all are welcome! In the morning we'll enjoy a hike, followed by lunch. Then in the evening we'll meet for for drinks and heavy appetizers. Come join us! Posted August 13, 2018 by Shelby. On Thursday, September 20, 2018, visit with old friends and meet new moms of Riverdale!